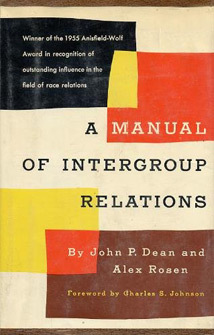 This book by an American social scientist and a social worker is “a practical guide for those actively engaged in reducing segregation and discrimination in public institutions, voluntary social agencies, and in other community organizations.” The authors are attempting to answer those who say that society can do nothing to eliminate discrimination except patiently to wait and hope that through some ill-defined “education” public opinion will change. They argue that men’s behavior has wide latitude despite what is in their hearts, and that discrimination is not necessarily related to the intensity of prejudice in the individual. Social policy can change behavior and exhortation and the dissemination of information about race by themselves can never be a substitute for the creation of a tolerant social environment through social action on a local and a national level. The assumption that contact between groups per se will help to break down prejudice may be questioned by some readers, but the authors support this assertion with statistics showing that the more contact a person has with other groups the lower is his level of general prejudice against them. Prejudice results more from contact with prejudiced people than from contact with the minority group itself. It is not a natural phenomenon, but the result of certain social pressures, and the way to fight it is to exert contrary social pressures to those prevailing in society. Alex Rosen, the first Dean of the reorganized Graduate School of Social Work at New York University, also developed outreach programs and improved health care services on the Lower East Side. Dr. Rosen retired in 1981 as professor emeritus of preventive medicine at the NYU School of Medicine where he taught with a major emphasis on community medicine. He held the concurrent position of Director of Urban Health Affairs at NYU Medical Center. His urban health unit developed new community programs to improve health-care services as well as combined MD - PhD curriculum for students of medicine, psychology, law, public administration and social, work. Attending graduate students fanned out to health and welfare agencies on the Lower East Side to assist patients and clients. Born in Brooklyn, Rosen graduated from NYU, he received a Master’s degree from the New York Graduate School of Social Work at Columbia University. and a PhD in human relations from NYU.